When you click the feedback number next to an eBay member’s user ID, you see all the tools you need to gauge that member’s reputation. Think of members’ feedback profiles as their eBay “report cards.” First, check out the Recent Feedback Ratings and Detailed Seller Ratings (DSR) areas. Looking at the number of positive ratings and the average star ratings (DSRs) gives you a pretty good idea of a member’s performance in eBay transactions. As an eBay member, your goal is to get straight As on your report card — in this case, as much positive feedback as humanly possible. You can get to your personal feedback profile page right from your My eBay page by clicking the number next to your user ID. 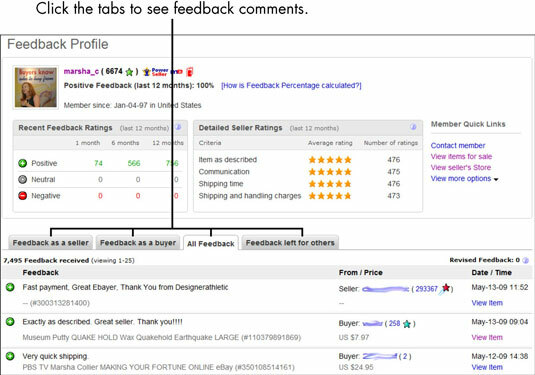 Below the Recent Feedback Ratings and Detailed Seller Ratings are the tabs that you click to see the actual feedback comments. You can choose to view All Feedback, Feedback as a Seller, Feedback as a Buyer, or Feedback Left for Others. The user ID of the person who sent the feedback. The number in parentheses next to the person’s name is his own feedback rating. The date and time the feedback was posted. The item number of the transaction that the feedback refers to. If the item has closed in the past 30 days, you can click the transaction number to see what the buyer purchased. Seller or Buyer — indicating whether you were the seller or the buyer in the transaction. Feedback bullets come in different colors: praise (in green with a plus mark), negative (in red with a minus mark), or neutral (in grey with a white dot). The feedback comment the person left about you. Sellers are allowed to leave only positive feedback for buyers. You can leave a “positive” while still being honest about your transaction, though. eBay made this rule so sellers wouldn’t leave retaliatory feedback to buyers who left them negative feedback. A feedback profile also contains a positive feedback percentage that appears on the line under the member’s user ID. Of course, having a high percentage here is good. Click the How is Feedback Percentage Calculated link if you want the details about how eBay does its math.